On the invitation of Kingdom of Mother Sai, with the blessings of Bhagawan, I attended the medical camp at Prasanthi Nilayam form 18th to 26th December 1982. Since it was only a medical camp and not an eye camp, I did not carry any surgical instruments with me. Bhagawan inaugurated the medical camp at Junior College for Boys on De­cember 18th by lighting the lamp. There were five other doctors who were special­ists in different medical fields. Since I was an ophthalmologist, I was, asked to look after the eye section. Students, graduates and staff of Sri Sathya Sai Women's College, Anantapur organized and assisted us in the medical camp. On December 19th as we sat for darshan, Swami asked us to examine the Prasanhti Nilayam women inmates for cataracts. After examinations, fourteen patients were selected. Smt. Pedda Bottamma (an old devotee of Shiridi Sai Baba), Who was 85 years old and had hypertension and asthma with paraplegia, was the only case unfit for cataract operation. On December 22nd morning nurses form Vishakpatnam came to Prasanthi Nilayam and they had no idea that there was a medical camp at Prasanthi Nilayam but they found out about the medical camp. After morning darshan they came to us, as we were preparing the operation theatre with the help of students. They told us that they were trained nurses in operation theatre for ophthalmology and inquired if they could be of any help to us. We gladly accepted assistance and entrusted the preparation of the operation theatre to the nurses and students. The non-availability of operation-theatre trained nurses was thus solved. Then at 9 A.M. when we examined Smt. Pedda Bottamma, we found that her health was in perfect, normal condition. Her blood pressure of 240/160 mm of Hg was down to normal 120/80 mm Hg and she had no symptoms of asthma. It was His Divine leela that made her normal. We were still worried about the non­availability of surgical instruments. At 10 A.M. a doctor (psychiatrist) from Pitts­burgh who was coming to India for the first time was touring Administrative Build­ing on the hill, saw a crowd near the . junior college. He inquired at the Administrative Building regarding the crowd. It was explained to him that there was a medical camp being conducted in the Junior Col­lege. He came down to the Junior College to find out if he could participate in the camp. He came to me and told me that he was a doctor (psychiatrist). An eye doctor from Chicago had-given him eye surgical instruments, to carry them to India and give them to Swami. So he wanted to find out if these instruments could be of some use in the medical camp. Since we had no surgical instru­ments for the operations, we told him to bring them. The instruments he brought were brand new and were the ones that were exactly required for the operations. We were happy to receive the instruments form him. So the non-availability of surgi­cal instruments was also solved. It was his Divine leela. Bhagawan came to operation theatre at 2 P.M. and lighted the lamp and wit­nessed the eye operation of Smt. Pedda Bottamma and another patient for about 30 minutes. Afterwards Swami inspected the post-operative ward, where the pa­tients were kept. After finishing the opera­tions, we sat for darshan at 5:30 P.M., Swami came to me and asked, "What have you done to Smt.Pedda Bottamma? Is her eye there or have you removed her eye?". Suddenly I fell at Swami's feet weeping and told him, "Forgive me, for you have killed my ego". Then Swami consoled me by materializing vibhuti, put­ting vibhuti on my forehead and told me that I was only an Instrument in his Divine play. He gave padanamaskar and went away. Next day Swami came to the post­operative ward and was asking Smt. Pedda Bottamma, "Why do you like to have physical vision when I have given you Inner vision?" After Swami left, Smt. Pedda Bottamma explained that Swami is Lord Krishna and the significance of physical and inner visions. Physical vision is only seen when eyes are open and when ob­jects are in front of the eyes. With Inner vision, Lord is in our Heart and we can see him always. This was the experience of Gopikas' Inner vision of Krishna. Women students nursed the patients with loving care throughout the post-opera­tive period and by Bhagawan's grace, all the patients recovered well and medicines were given to patients. At the end of the camp, we gave the instruments to the General Hospital at Prasanthi Nilayam. On December 26th, Swami called all the doctors and medical staff for an inter­view. Few devotees from California had also been called for the interview along with us. Swami questioned all of us, "Where is God?". We couldn't answer it and one of the California devotees, an­swered, "God is in our Heart." Then Swami told of us, "God is not only in our heart. He is besides you, above you and omni­present. Devotees form abroad are seeing the Light and are getting enlightened, whereas, Indians are under the Light and are not able to see it. See God in every person, because all are God's children with divine spark. Serve the patients with love and affection." 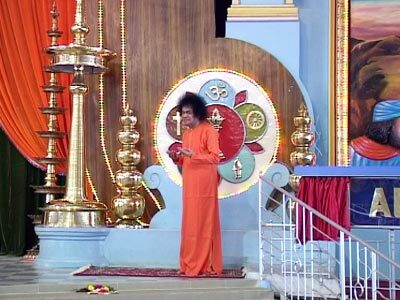 Then Swami presented us golden pens and then he to!d us, "These pens are made of pure gold. Just like this pure gold, all of you should serve with pure heart and one should be able to sacrifice in any situation." In the beginning we were in a big dilemma as to how the eye camp would be successful without surgical instruments and theatre trained nurses. Since Swami is GOD, he knew all along the whole eye camp would be successful, because he planned it that way. What I learnt from this memorable experience of my life was that God is the Doer and we are all but his instruments.